What is a Kiblah, and why is our “East” to be Boleskine House? The Arabic word Qiblah, or “Kiblah,” refers to the holiest shrine of Islam. At the center of the courtyard of the Great Mosque at Mecca is a stone building called the Ka’abah (cube) or the Bayt-Ullah(House of God). The original Ka’abah, or “Kaaba,” is reputed to have been built by Ibrahim (Abraham); and Ismail (Ishmael), his son and the legendary founder of the Arabic Race, is allegedly buried nearby. Built into the exterior of the eastern corner of the Kaaba is the Hajar al-Aswad, the Black Stone. The Black Stone is said to have been given to Abraham by the Archangel Gabriel [see Note 1]. Five times each day, devout Sunni Muslims turn toward Mecca to pray (Muslims within the confines of Mecca turn toward the Kaaba), and they are expected to make pilgrimage there at least once during their lifetime. The term Qiblah denotes not only the physical location of the Kaaba, but also, and more importantly, the direction to which a Muslim turns his face to pray from wherever he may be standing on the face of the Earth. All mosques are aligned with the Kiblah, which is indicated within each mosque by an empty niche, called the mihrab. The word Qiblah is derived from the Arabic root Qabala, which means “to be opposite.” It enumerates to 137. The Kiblah, then, represents to the focal point of the magical current of a cult or religious system, the reservoir of magical energy which can be drawn upon by all who devote themselves to its Mysteries. Most religious systems include a similar concept. Christianity and Judaism have their Jerusalem or Mount Sinai, the Samaritans have their Mount Gerizim, Hinduism has its Mount Meru or Mount Kailasa, the Greeks had their Mount Olympus or the Omphalos at Delphi. Thelema has its Boleskine. In the Thelemic system, the word “Kiblah” refers to the Stèle of Revealing, through which the Equinox of the Gods was revealed to our Prophet. The “abstruction,” or replica, of the Stèle was originally housed at the manor of Boleskine and Abertarff, situated on the South-Eastern shore of Loch Ness in Scotland, 2 miles east of Foyers, 17 miles from Inverness. The manor, which was the Prophet’s home at the time, is usually known simply as Boleskine, which is pronounced boll-ESS-kin. Transliterated into Hebrew, Boleskine is BVLShKIN, which enumerates to 418. “But your holy place shall be untouched throughout the centuries: though with fire and sword it be burnt down & shattered, yet an invisible house there standeth, and shall stand until the fall of the Great Equinox; when Hrumachis shall arise and the double-wanded one assume my throne and place.” — Liber AL III:34. Thus, the location of Boleskine House is to be the Omphalos or Center of Power for Thelema, and is to continue as such for the duration of the Aeon of Horus, regardless of the physical presence of the Stèle or of the house itself. Thus, O.T.O. Lodges, Profess-Houses and Gnostic Mass Temples are ideally to be oriented towards Boleskine, and a replica of the Stèle of Revealing is to be placed at the highest point on the super-altar in the “East” of each Temple consecrated to the performance of the Gnostic Mass. The Greek word STHLH, from which we derive our word “Stèle,” carries the following meanings: a block of stone; a support or prop; a monument; a covenant; a gravestone; and a sarcophagus. The Omphalos at Delphi was a boss of stone set upon the burial site of the sacred Python, slain by Apollo. The Delphic Oracle, while seated upon the Tripod, maintained constant physical contact with the Omphalos by holding in her hand one end of a sacred thread, the other end of which was fastened to the Omphalos. This connected her with the archaic energies of the Python, which were essential to the proper transmission of the Oracle. 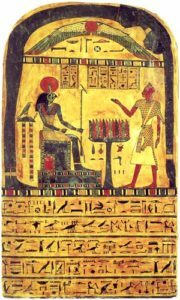 The Stèle of Revealing is the funeral tablet of Ankh-af-na-Khonsu, a Priest of Monthu who lived in Thebes during the late XXVth dynasty of ancient Egypt, around 725 p.e.v. 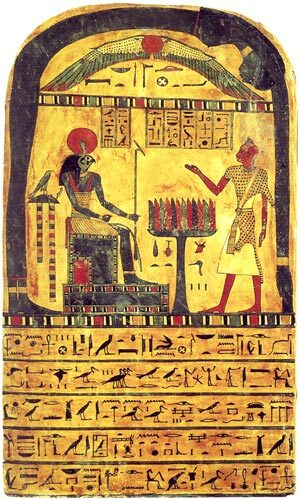 According to Aleister Crowley’s mythic story, “Across the Gulf,” Ankh-af-na-Khonsu was responsible for ushering in the Aeon of Osiris. Aleister Crowley assumed the magical identity of the dead man Ankh-af-na-Khonsu as the living Prophet of the Aeon of Horus, the deliverer of The Book of the Law. The Stèle thus represents the oracular connection of The Book of the Law and the Law of Thelema with the archaic energies of ancient Egypt, transformed and renewed in accordance with the cyclic pattern of aeonic evolution. In the Christian Mass, the Cross is set up above the Altar. The Cross is a symbol of the death and resurrection of Christ, and the Altar is the traditional place of sacrifice. Many denominations incorporate relics of Saints beneath or within the Altar or sewn into the Altar cloth, and it was an early Christian custom to celebrate Mass upon the tombs of martyrs. Part of the ceremony of consecration of an Altar in the Roman Catholic Church includes the “burial” of a relic inside the Altar. The oblong shape and dimensions of the modern Christian Altar are probably derived from the shape and dimensions of a sarcophagus. The shape of the Altar also recalls that of the Arc of the Covenant, which contained the sacred relics of the foundation of Judaism, and upon which the feminine Presence of God, the Shekhinah, is said to have appeared. While much of the symbolism of the Altar in our Gnostic Mass is essentially congruent with that of the Altar in the Christian Mass, one aspect is significantly different. In the Gnostic Mass, the feminine Presence of God has been restored to her place upon the Altar, affirming that the Altar is not only the place of sacrifice, but the place of living communion as well. The Stèle in the Gnostic Mass Temple is, in effect, a “pipeline” through which we may commune with the subtle energies of the Thelemic current which intersect the visible world at the “invisible house” located at Boleskine. The proper orientation of the Stèle towards the Kiblah of Boleskine symbolizes alignment with the Thelemic current, and magically insures a strong link with its energies. Boleskine is located at Latitude 57°16’00” North, Longitude 4°27’45” West [see Note 2]. The Kiblah, or precise angle towards Boleskine from true North at any point on the globe, following the shortest possible path, may be determined using Napier’s Analogies to solve a spherical triangle with one vertex at Boleskine, one at the point in question, and the third at the North Pole. The equations for Napier’s Analogies may be found in the “CRC Standard Math Tables” or in any good textbook on spherical trigonometry. Angles toward Boleskine from true North (to the nearest 1/2 degree) for a selection of cities around the world are provided in the table at the end of this chapter. The Kiblah may also be computed this way. Unfortunately, it is rarely possible to physically align the Temple precisely with the Kiblah. In any case, the location of the Stèle in the Temple defines the “Magical East” of the Temple; but when the Magical East does not physically coincide with the Kiblah, the proper link between the Stèle and Boleskine must be forged more strongly in the hearts and minds of the ritual participants. This link may be reinforced by a preliminary performance of a focusing ritual such as Liber V or XXV, or the Thelemic Lesser Banishing Ritual of the Pentagram, in which the Magician begins the ritual facing the Stèle and “Magical East.” It may also be reinforced by more elaborate means. For instance, a ceremonial consecration of the Stèle may be composed and performed, wherein the Stèle is set up in precise alignment with the Kiblah while appropriate verses of Liber AL are recited, and the personified forces of the Thelemic current are invoked to strengthen the link. The Stèle may then be moved to its position in the “Magical East,” maintaining the link intact. This is not the only “Black Stone” to occur in the history of religions. In 218 e.v., the Roman Emperor Elagabalus (“Heliogabalus”), who had been a priest of the local Baal in the Syrian city of Emesa (Homs), established the cult of the Sol Invictus Elagabal in Rome. This Deity was worshipped in the form of a black, conical, meteoric stone, and was ceremonially “married” by Elagabalus to an image of the Moon Goddess Astarte. The devotees of Cybelê also revered a black, meteoric stone. A footnote in Liber V states that Boleskine is “on Loch Ness, 17 miles from Inverness, Latitude 57.14N., Longitude 4.28W.” However, these coordinates appear to be for the village of Foyers rather than for Boleskine itself.